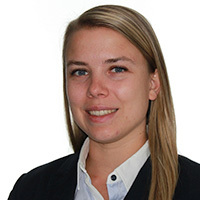 Olivia Molenda is a Postdoctoral fellow with Dr. Elizabeth A. Edwards in the Department of Chemical Engineering and Applied Chemistry at the University of Toronto. She has a B.Sc. in Environmental Science from York University and a Ph.D. in Chemical Engineering from the University of Toronto. Her research interests include applied bioinformatics, statistics and microbiology from the field of bioremediation. Bioaugmentation, using a mixed microbial culture, is an effective technology available for stimulating complete detoxification of groundwater contaminated with perchloroethene (PCE) or trichloroethene. The KB-1 culture has been used for over a decade for this purpose containing Dehalococcoides mccartyi capable of stepwise complete dechlorination of PCE. After DNA sequencing and analysis we assembled the genomes of eight different strains of D. mccartyi from KB-1 and with them an assortment of associated mobile DNA. The most interesting mobile DNA included the regions containing the vinyl chloride reductase genes both vcrA and bvcA. Further experiments were conducted verifying the mobilization of vcrA and bvcA genes independently from the genome giving us first hints to horizontal gene transfer and a better understanding of the genetic potential of D. mccartyi in KB-1.